There are some very readily available edible plants that are found in most climates that you can use to supplement your diet. Many are a great source of vitamins and minerals and they can definitely give you the fiber your body needs to function. Many people believe that when the stuff hits the fan they can “just go into the woods and live off the land with edible plants.” I say, “More difficult to do than you think, and you can do it best if your main food source is in meat and fats.” With that said, unless you are having an emergency food shortage in the middle of an avocado grove, you just simply cannot forage the calories you need to suffice your body for an extended amount of time without the majority of your calories coming from meat and fat. Men need roughly 2,500 calories a day and women about 2,000 calories a day. These numbers are based on something called “average daily metabolic needs.” Meaning most of those calories are used up by normal bodily/organ functions such as breathing, sitting, walking. This is the base for anyone just living comfortably. Now, add on stresses of food supply interruptions, power outages, having to walk extended amount of time to forage and you will be adding even more calories to your daily needs. If your body is under any sort of stress—being too cold or hot, for example, then your basic caloric needs will rise. Ounce for ounce, protein from a meat source gives you more calories than any other food source in the wilderness so I do recommend making sure you know how to trap animals or learn to fish and suggest that you take this knowledge into consideration if you are one of the many who think that you can just go and “live off vegetation alone” if your everyday food supply is shut down or interrupted. There are some very readily available edible plants that are found in most climates that you can use to supplement your diet. Many are a great source of vitamins and minerals and they can definitely give you the fiber your body needs to function. Some you will see are not only a food source but they also are useful for making survival items you may need in a survival situation and in some situations the plant is not only edible, but medicinal as well. Take caution, this article is not intended to be a “plant identification” article. You are responsible for properly identifying the plants I am featuring. Please know that I am not a medical doctor and I don’t pretend to be one. I strongly suggest a plant identification book for your climate zone. 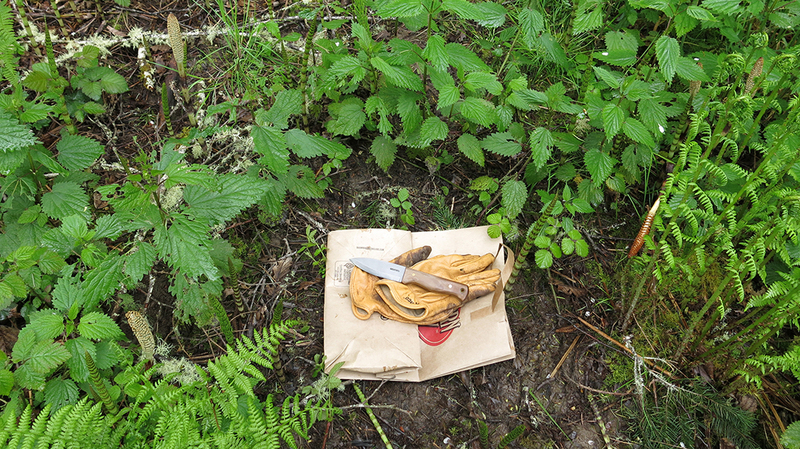 Always make sure you have properly identified your wild edibles before you put them in your mouth. 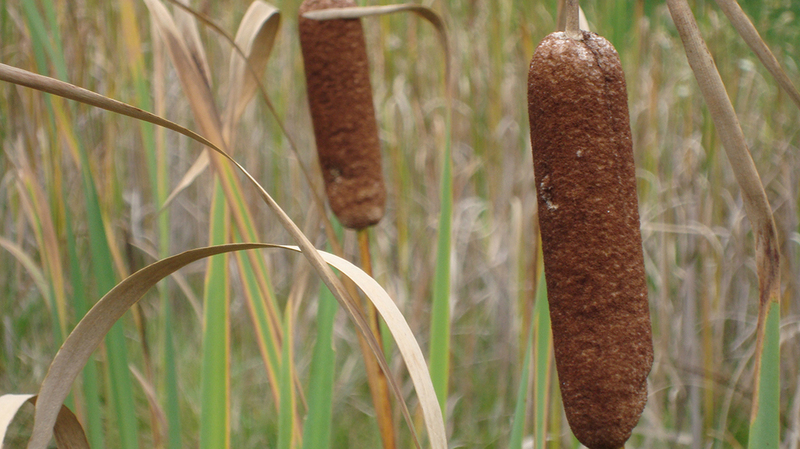 Cattails are one of the most versatile and useful plants around. Most of the plant is edible. Additionally Cattails are a useful plant for survival. They produce “fluff” for insulation and the stalks can be dried and used to make strong cordage. The soft lower stalk can be eaten raw. The flower stalk at the top can be eaten raw like corn on the cob when it is a young plant. It tastes similar to corn. Once the flower stalk matures you can fluff it up and use it for insulation to keep warm. Additionally the stalk of the plant can be made into rather strong cordage. 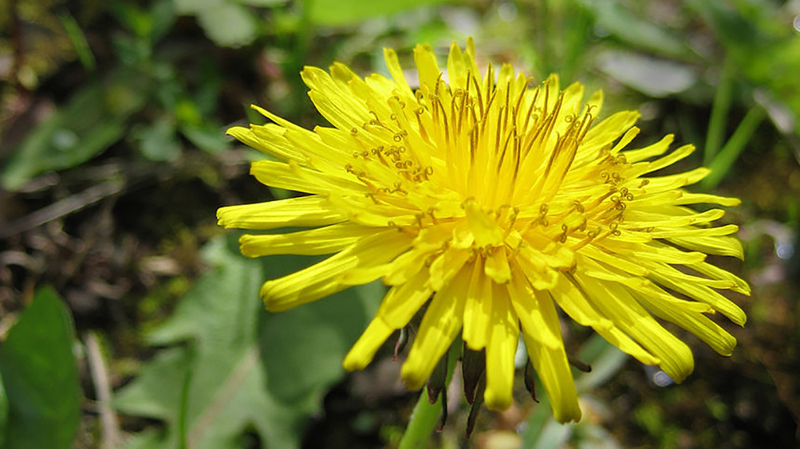 Dandelion is widely considered a measly “weed.” Dandelion is not only edible, but it is widely used in herbal medicine. It is known to reduce water weight and promote liver health. It also makes a great tea. This is a very common plant most consider a measly “weed.” The fact is that this weed is edible. The entire plant is edible from the roots, leaves up to the yellow flowers. Dandelion is not only edible; it’s widely used in herbal medicine. It’s known to reduce water weight and promote liver health and more when used as a tea. Just simply add hot water to the leaves and let it steep. I have even made dandelion wine and it’s great! You will want to pick and eat the leaves while the plant is still young. The older the plant, the more bitter it tastes. You can boil the leaves and eat like spinach or add the raw dandelion leaves to a salad and then garnish with the yellow flower. Despite the “sting” this plant gives your skin when you pick it, this plant is highly edible and delicious. Boiling this herb will get rid of the tiny irritating hairs. I like to boil slightly and then saute in butter with a little salt. You can add this as you would spinach to soups and stews. 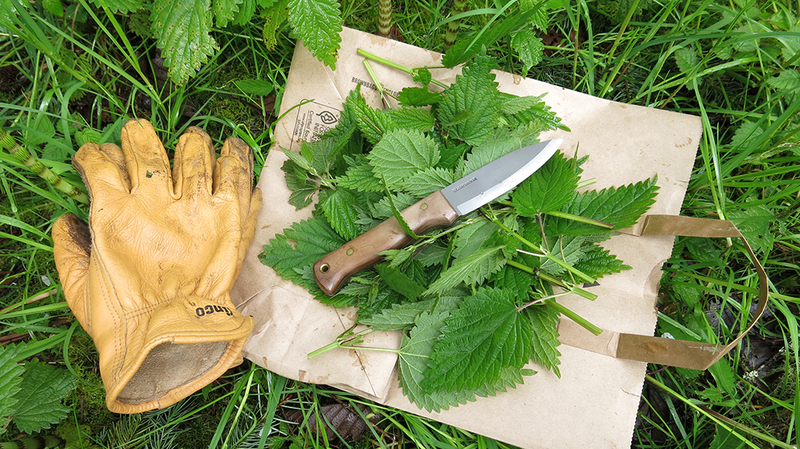 Stinging Nettle is a great source of iron and can be used medicinally as well. These are actually very edible! It is one of my favorite wild greens and I eat it each year as it grows in abundance on my property here in North Idaho. The edible plant is a perennial flowering plant that has been used as a food and medicinally dating back as far as Ancient Greece. It is found all over the world. Stinging nettle has heart shaped leaves and produces yellow or pinkish flowers. Rub up against this plant with your bare skin and you will find out how it got its name. The leaves contain a number of chemicals which can be very irritating such as acetylcholine and histamine. The leaves have tiny hairs on them that break off and remain on your skin. These hairs deliver the chemicals to the skin and the reaction can cause pain, swelling, itching, burning, and numbness. Not a fun time! Many people don’t know that if you take the leaves and smash them up into a wet paste and apply this paste to the irritated area—it actually is the remedy for the reaction. So it hurts you and then can heal you. Boiling or frying in butter or oil is the best way to prepare this wild edible. Boiling this herb will get rid of the tiny hairs thus making the plant edible. The tiny hairs boil down soft and you can eat it like you would spinach. I like to make nettle quiche by adding nettle leaves in place of spinach leaves in the summer when this plant is abundant. Like spinach, it is high in iron. Again, this is another plant that has medicinal qualities as well. You can dry the leaves and make a tea out of it treat joint pain and as a mild diuretic. It also has been found to treat eczema, arthritis, gout and anemia, as well as allergies and urinary tract issues. Thistle is known as a nuisance plant. The root can be eaten raw or cooked. It tastes like a cross between celery and asparagus. Tea can be made with thistle leaves, but be careful to wear gloves and eye protection while procuring this delicious edible. Thistle, in the sunflower family, is found growing all over North America and Canada and it’s even been found in the Arctic Circle and Greenland. Thistle plants are very spiny which make it difficult to procure. This is most likely the reason it never made it into a mainstream food. 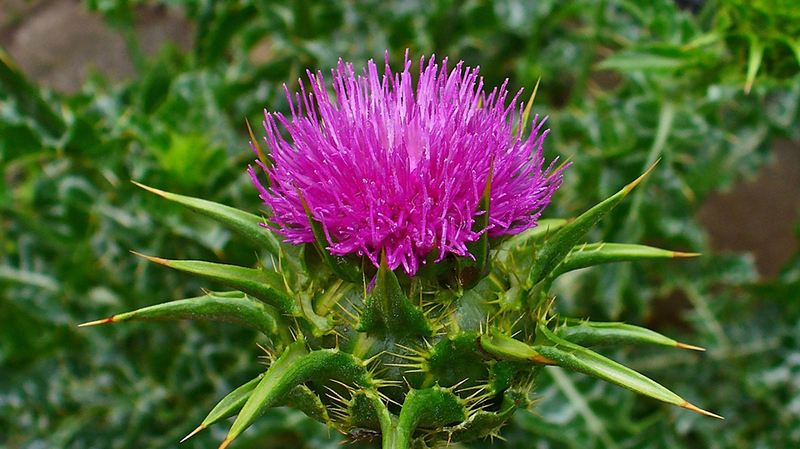 There are many types of thistle but none are poisonous. Only some are palatable, however. They have a two-year growth cycle. The first year the plant is just a root and a rosette. The second year it makes the stem and blossoms. One of the parts of the plant that is edible is the root. It takes a bit of technique to gather, but it’s well worth it. The root tastes like a cross between a crunchy and juicy celery mixed with flavors of asparagus. You can eat it raw or sauté it in butter and garlic. The older the thistle the more fibrous it becomes which makes it non-palatable. You can make tea with the leaves. You can also eat the stalk above the ground if it’s not too old and fibrous. It tastes like celery/asparagus but not as juicy as if you take the extra time to dig to get the root—the juicy root is absolutely delicious! Clover is found all over the world. The pink blossoms are the most flavorful and they make excellent teas. The taste is similar to vanilla. 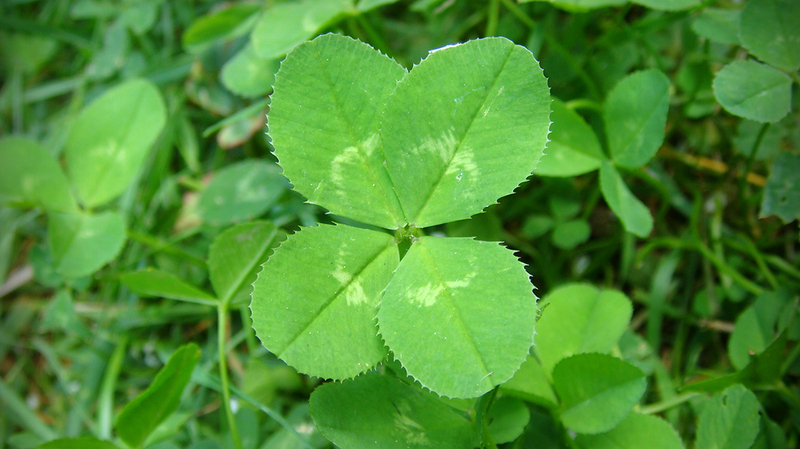 Clover leaves contain protein, vitamin C, most of the B vitamins, choline, beta carotene and many other nutrients. Eat leaves when young and in small amounts. This is found literally all over the world so this makes it one of the most readily available wild edible around. The leaves are an acquired taste and are largely considered a survival or famine food to eat in emergencies. It has been used as a pasture crop worldwide for a long time. The white or sometimes pink blossoms are the most flavorful. They can be eaten raw or dried to make tea. They have a hint of vanilla taste and smell. Eat the leaves as you would spinach: fresh raw or cooked. If you eat the leaves raw eat them while plant is young. The leaves are more palatable when young. Keep in mind, the leaves are digestible raw in small amounts (about ½ cup). While the leaves are bitter to taste, they are very high in nutrients. The leaves are high in protein, Vitamin C, most of the B vitamins, choline, beta carotene, inositol, biotin and bioflavonoids. One word of warning though: some people are allergic to it and don’t know it. So go easy on trying it for the first time. Make sure if you eat it that it is fresh or dried. Do not ever ferment this vegetable. It can produce small amounts of cyanide if fermented and that’s not a good thing for obvious reasons. “The berries can be used in pies, pancakes, to make wine with or make jam. The berries are a good source of vitamin A, C, B6, Iron Potassium, and fiber. These are one of my favorite wild edible plants. They are found abundantly on our property in Idaho near our wetland. Make sure, as with all plants listed here, to properly identify these plants. There are a couple of plants that can be confused with blue elderberry that are highly toxic. (The plants that are toxic are: Pokeberry, dwarf elderberry and water hemlock) Just make sure you do your homework on identifying this plant. Once you are familiar with it, there will be no mistaking it. Also, this plant has a stimulating effect on our immune systems so if you have an auto-immune disease such as lupus, multiple sclerosis or other, please avoid eating blue elderberry. The blossoms, flowers and berries are edible. Do not eat the stems or leaves. 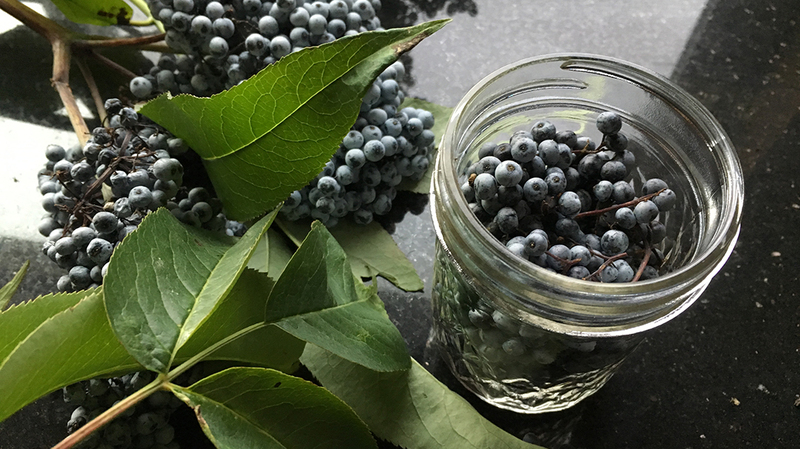 The ripe berries are medicinal when made into an blue elderberry tincture (I make and keep on hand every year) has been studied and is known to be a powerful anti-viral. In fact, it is often referred to as the Tamiflu of the wilderness. You can eat the flowers raw or cook them. I like them raw. The berries need to be prepared. Collect them, remove all stem material and wash them in water. Place berries into skillet on low heat until they cook and ooze the dark purple juice. Mash the berries. Simmer slowly for eight minutes. Cool. 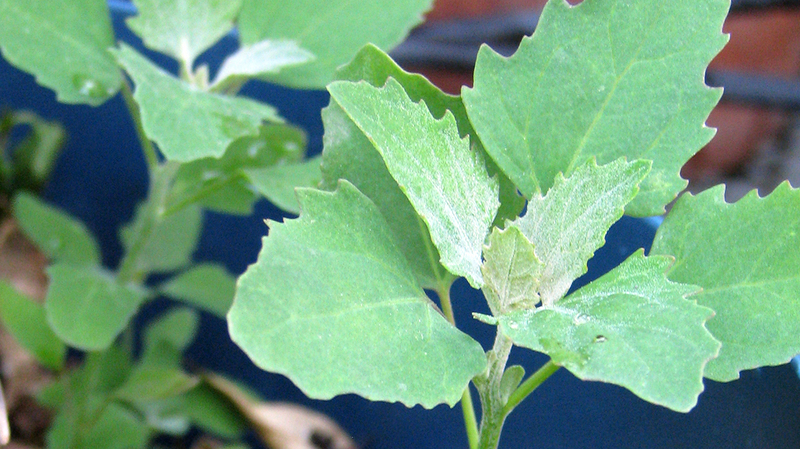 You can add this mash to pies, pancakes, make wine with them or make jam with them It is also a good source of Vitamin A, Vitamin B6, Iron and Potassium, and a very good source of dietary fiber and Vitamin C.
Lambs Quarters aka Goosefoot are found all over the world in gardens and streams. It is a relative of wild spinach and rich in Vitamin B2 and Iron. This is also known as “Goosefoot” because of the shapes of the leaves. 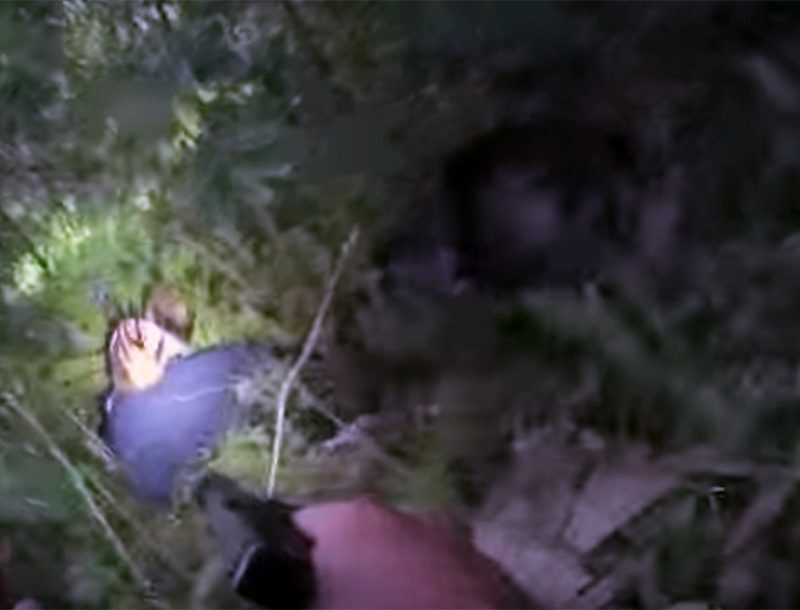 This makes it easy to identify. Lamb’s Quarters is a common weed in gardens and streams. It is found all over the U.S. and Canada and is very hearty. The edible plant is a relative of wild spinach. It always looks a little dusty. There is a white powdery coating on the leaves. This powder, similar to the white powder found on plums, is yeast and can be used to procure yeast from a natural source. The leaf is jagged-edged and shaped like a diamond. The interesting thing about this plant is that it is high in protein. These edible plants is one of the few that are high in protein without being a bean plant. It is also rich in Vitamin B2 and Iron. You can eat it raw in salads or cooked. It tastes like kale and collards. Don’t eat the seeds. Don’t eat Lamb’s Quarters raw in large quantities because the bitter taste of it contains oxalic acid. Cooking the leaves removes this acid. Suggested preparations for eating are: Steaming, frying in butter, blanching and freezing to add to soups or sauces later. Drying is another way to add this nutritious plant to your meals throughout winter. This is a very available and nutritious plant and one to definitely get to know. Seaweeds are typically high in fiber and are a “complete protein. You can use seaweeds in soups or eat it raw. 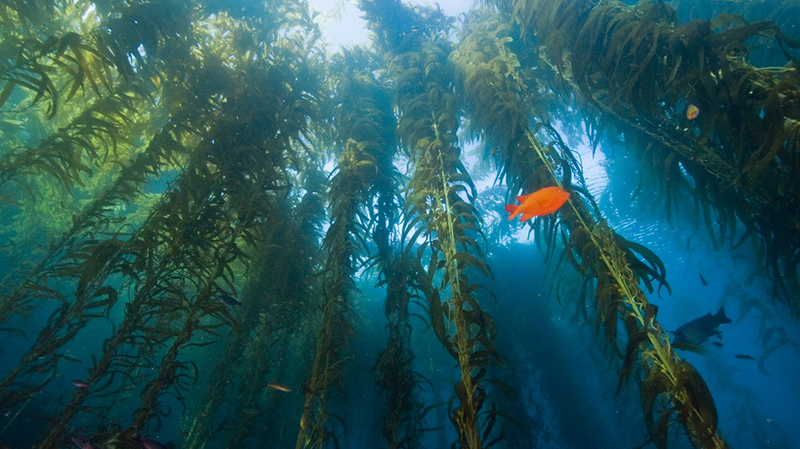 Kelp consumption is known as an anti-aging substance and it’s known to help prevent cancer. These are algae that are edible and can be used in preparation of food. Seaweeds are typically high in fiber and are (believe it or not) a “complete protein.” Many vegans and vegetarians use seaweed as an alternate source of protein for their diets. Most edible seaweeds are of marine origin (the ocean) while most freshwater algae are toxic. So, if you eat any seaweed, make sure it comes from the ocean environment and not a freshwater source. 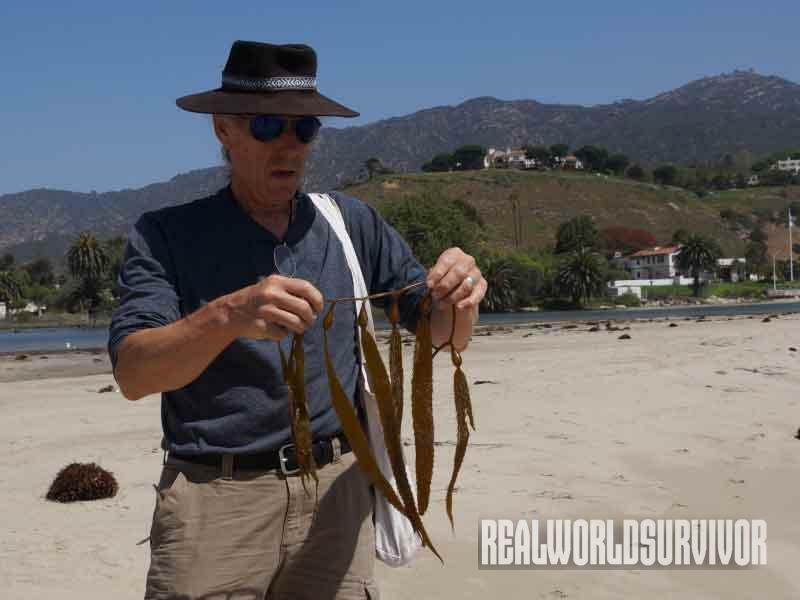 You can put kelp in soups and salads. They are high in carotenoids (anti-aging substance) and are now known to help in preventing cancer (including breast cancer in women), heart disease and strokes. Kelp is known as being an excellent body system detoxifying food. Kelp contains an astonishing amount of vitamins and minerals, particularly iodine, which has a normalizing effect on the thyroid gland that controls the body’s growth and development. Now that you know a few of these commonly found edible plants, why wait for an emergency to start identifying and experimenting with them? 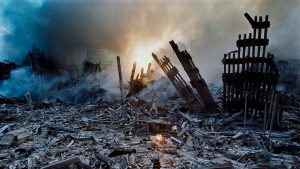 Don’t wait until a disaster occurs. Go out and take your time now to identify and learn to prepare these plants so it is second nature to you if you need them. Try incorporating them into your meal plan now. Start identifying these plants and once you have them down, then you can add a plant or two a month to your repertoire. Before you know it, you will be able to identify many plants as edible that you once just either considered mere weeds or that you have walked by for years not knowing of their uses. Remember, “knowledge is power!” As a person of survival, you will need to “actively pursue” obtaining this knowledge in order for you to be able to apply it to your life. This article is from the fall 2017 issue of Survivor’s Edge Magazine. Grab your copy at OutdoorGroupStore.com.